Professor Barry Chernoff joined the Wesleyan faculty in 2003 where he holds the Robert F. Schumann Chair of Environmental Studies. He is the director of the College of the Environment. Barry teaches courses in Environmental Studies, Tropical Ecology, Aquatic Ecosystem Conservation, and Quantitative Analysis for the departments of Biology and Earth and Environmental Sciences. Chernoff's research centers on the freshwater fishes of the Neotropical region, primarily those in South America in the Amazon. 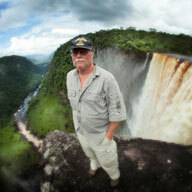 His research includes, ecology, evolutionary biology and conservation. He has also led international teams on expeditions designed to conserve large watersheds of the world, having made more than 32 expeditions in 12 countries. Recently, Professor Chernoff and his students have been working on aquatic ecology and conservation of Connecticut watersheds. In the past he has held professorial and curatorial positions at the Field Museum, University of Chicago, University of Illinois at Chicago, University of Pennsylvania and the Academy of Natural Sciences of Philadelphia. He holds a visiting position at Universidad Central de Venezuela. He has authored and co-authored more than 87 scientific articles and books. Chernoff has received a number of awards including the Caleb T. Winchester Outstanding Scholar and Teacher Award in from Xi of Psi Upsilon, Wesleyan University and a Commendation for Excellence in Teaching, University of Chicago in 2000. Chernoff was elected to the Connecticut Academy of Sciences and Engineering in 2005, where he now chairs the Environmental Science and Technology Board. From 1993-1999, he served on the U.S. National Committee for the International Union of Biological Sciences elected by the National Academy of Sciences/National Research Council, and served as vice chairman from 1995-1997 and chairman from 1997-1999. He serves on the Inland Fish Commission's Endangered and Threatened Fishes Panel for the Connecticut Department of Environmental Protection. Chernoff co-wrote the script for a short documentary film entitled "Understanding Biodiversity" that was awarded finalist status at a number of film festivals, including Cannes, Toronto and Sundance, and received the Silver Apple Award from the American Educational Network. He has served on the boards of a number of community-oriented foundations, including the Confluence Greenway Project of St. Louis, Mo., and as President of the Sustainable Aquatic Research Center. Chernoff served as President of The Jonah Center for Earth and Art, from 2004-2010 in Middletown, CT.